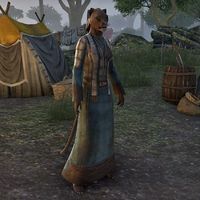 Ejukki is a Khajiit member of the Mages Guild and part of Telenger's team found at the ruins of Ezduiin. Talking to her, she'll say, "Everyone here only cares about impressing Telenger. It's all Ejukki hears day in and day out." You're not here to impress Telenger? "No. This one is here to learn. These others seek only advancement in rank. Ejukki seeks true knowledge. The Artificer accepted this one based on true skill. Not a bloated recommendation letter." You think the others lied to get here? "Telenger is brilliant, but naive. His knowledge of archeology is vast. His knowledge of the mind and its motivations lacks." After completing the Ezduiin objective, she'll say, "This one is glad someone was able to get the situation under control." This page was last modified on 14 October 2017, at 19:36.